Three years ago, Lt. Ed Garza was packing his bags for a fishing trip to Ontario, Canada with three military friends when a wave of anxiety came over him. The trip to Canada promised to be a relaxing and fun-filled excursion, and one that Garza had been looking forward to for months. As the day of departure drew nearer, however, Garza’s unease unexpectedly escalated. It had been more than six years since he fought in the Iraqi War, but the prospect of leaving family to travel to an unfamiliar place with relatively new friends stirred up significant emotions that were bred during his combat experience. His friends, Don Aiken, Jim Kortman, and Rob Blanchar, persuaded him to go, and the experience was life-changing. For the first time since his tour overseas with the U.S. Navy, Garza was able to share openly about his combat trauma, and the result was immediately cathartic. Since that time, Garza, a Bronze Star Medal recipient, has helped hundreds of other military veterans obtain a college degree, navigate the transition to the civilian world, and improve their overall health and well-being. Shortly after his Ontario trip in July 2015, Garza took the helm of Concordia University Wisconsin’s newly formed Veterans Services Department. With Garza’s leadership, Concordia became the first university in the state to establish a Veteran’s Post on campus. Since then, the university has served more than 600 service men and women, with 455 currently enrolled for the 2018-19 academic year. Thanks to Garza’s expertise and hands-on approach, Concordia is able to accept more military transcript transfer credits than any other university in the state, which streamlines military members’ road to commencement. More than 140 veterans have earned a degree within three years from Concordia as a result. CUW also participates in the Yellow Ribbon Program, which helps fund tuition beyond the yearly federal funding tuition cap. Additionally within the last two years, the university became the inaugural recipient of the Wisconsin Veterans Chamber of Commerce’s “Veteran University Partner of the Year” award and gained Military Friendly status, a nationally recognized title that denotes an organization’s commitment to the military community. A year after Concordia’s Veteran Services Department was formed, Garza and his fishing buddy Aiken co-founded Healing Patriots, the mission of which is to provide therapeutic outdoor expeditions to injured veterans and first responders. Through Healing Patriots, Garza is able to provide others with the same kind of relief he experienced on his fishing trip to Ontario three years ago. Looking back, Garza recognizes that the timing of his trip couldn’t have been more perfect. 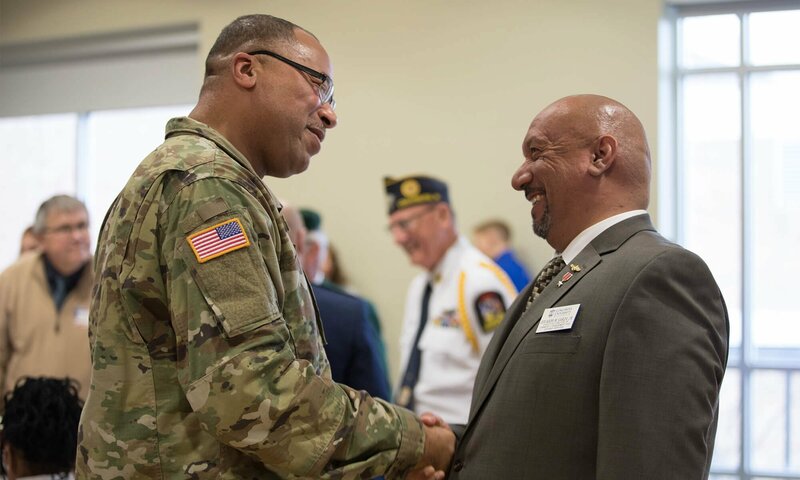 With plans laid for Concordia to launch its Veterans Services Department, Garza said he’s confident his own therapeutic excursion compelled him to receive the help he didn’t realize he needed in order to help others. Learn more about Concordia’s Veteran Services Department here. How did we get here? A primer for the opioid crisis.